The story has been breaking across the internet in furious fashion all afternoon. Chase Utley, the former Philadelphia Phillies all-star and current member of the Los Angeles Dodgers, will hold a press conference later today to announce his retirement from Major League Baseball. The Pasadena-born Utley had first been drafted by his hometown Dodgers in the 2nd round of the 1997 MLB Amateur Draft out of Polytechnic High School in Long Beach, California. However, he chose to attend UCLA on a baseball scholarship instead. In the 2000 Draft, the Phillies made him their first round pick at 15th overall. The rest, as they say, is history. Utley's big league debut on April 4, 2003 at Veteran's Stadium was entirely forgettable. With two outs in the bottom of the second inning and the Phillies already trailing the Pittsburgh Pirates by 6-1 at Citizens Bank Park, manager Larry Bowa called on Utley to pinch-hit for starting pitcher Joe Roa. Utley worked a full count, but ultimately struck out swinging against Bucs right-hander Jeff Suppan. He wouldn't appear in a game for nearly three more weeks, getting his first start at second base on April 24, 2003 at The Vet against the Colorado Rockies. This one would prove far more memorable. Utley hit eighth in Bowa's lineup that day. He would go 2-4, scoring twice and driving in four runs. It was the manner in which he registered those first four career RBI that was most memorable of all. With two outs in the bottom of the third inning and the Phillies already in front 2-0, Utley stepped in with the bases loaded against Rockies right-hander Aaron Cook. He wasted no time, blasting the first Cook offering over the right field fence for a grand slam. It was just the first of so many thrilling moments in a career with the Phillies that would span parts of 13 seasons. Utley now ranks ninth on the all-time franchise list for games played, at-bats, and hits. He is sixth in home runs and doubles, seventh in RBI, and 10th in Walks. He was an NL all-star for five straight seasons from 2006-10, and then once more in 2014. Utley also received National League MVP votes each year from 2005-09. He was the NL Silver Slugger Award winner at second base each year from 2006-09. And, of course, Utley was one of the most important pieces in the Phillies drive to a championship in 2008. His heads-up defensive play in the top of the seventh inning of Game Five of the World Series at Citizens Bank Park is one of the two greatest defensive plays in franchise history. With two outs and the game with the American League champion Tampa Bay Rays knotted at 3-3, Utley threw Jason Bartlett out at the plate after deking him with a fake throw to first base. Utley punctuated that championship with a particularly colorful expletive during the club's public post-parade celebration at the South Philly ball park. It only served to endear him even more to the title-starved multitude in attendance and watching on television. For a particularly hustling play earlier in his career, Utley had the moniker "The Man" hung on him by legendary Phillies broadcaster Harry Kalas. It stuck, and Phillies fans have lovingly embraced him using that nickname ever since. As that championship team aged and was broken up, Utley's turn to leave finally came on August 19, 2015. That day he was dealt to the Dodgers in exchange for a pair of prospects, pitcher John Richy and infielder Darnell Sweeney. Utley has since re-upped with the Dodgers four times on one-year contracts. He now has 1,880 career hits with 259 home runs and 1,025 RBI. He ranks 10th in the all-time MLB career JAWS ranking among second basemen. There is a chance that he at least ties Ryne Sandberg for ninth before Utley retires at seasons-end. JAWS was created to help measure a player's Hall of Fame worthiness. It takes their career WAR mark and averages it with their seven-year peak WAR. Utley's JAWS mark is higher than players in the Hall of Fame such as Jackie Robinson, Roberto Alomar, and Craig Biggio. Of the nine players ahead of Utley, seven are in the Hall of Fame. One of those, Robinson Cano, is still active. That will soon become the debate: is Chase Utley a Baseball Hall of Famer? One thing is for certain, Utley is going to be enshrined in the coming years on the Phillies Wall of Fame. 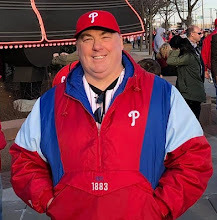 He will be feted in a ceremony at Citizens Bank Park that just might be the most popular ticket in town in whichever year during the 2020's that the ceremony takes place. Phillies fans will get one more chance to say goodbye to Utley as an active player. The Dodgers come to town for a series beginning in just 10 days. That three-game set will take place from Monday, July 23 through Wednesday, July 25. Good seats remain on sale.